The disk based Mac/65 comes with OSS (FTE) DOS XL. While DOS XL is a strong DOS, it’s not my favorite. I wanted a SpartaDOS based Mac/65. This is how I did it. 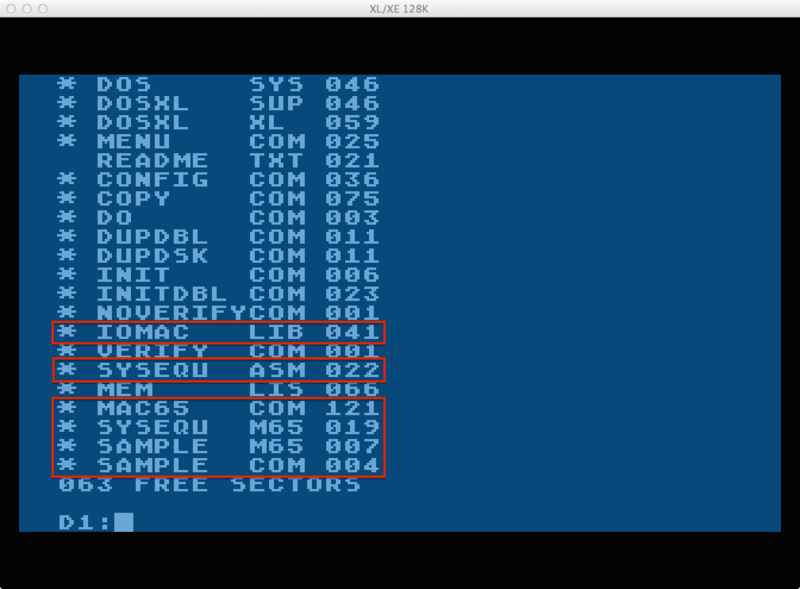 I showed you how to create a 720K disk image for use in the Atari 8 bit emulators in this blog entry. First stop, create that image (with DOS installed on it – all files). Instead of naming it SD720K, name it something like “MAC65SD” for Mac/65 SpartaDOS. Insert your new SpartaDOS 3.2g in disk 1. Insert your Mac/65 4.2 disk in disk 2. Cold boot the Atari from the emulator. Proceed when the SpartaDOS “D1:” prompt appears. Eject the Mac/65 4.2 disk from drive 2, you no longer need it.